Lao Pdr : No obstacle' to Laos-China rail link !! No obstacle' to Laos-China rail link !! There are "no obstacles" to Laos' planned high-speed rail link from China, the country's transport minister was quoted as saying Thursday, days after the Asian Development Bank called the project "unaffordable" for the developing country. 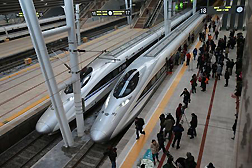 Construction on the seven billion dollar, 421 kilometre, Chinese-Lao railway "would begin shortly after all parties had reached an agreement and all preparations were complete," the Vientiane Times quoted Minister of Public Works and Transport Sommath Pholsena as saying. The ADB called for caution, noting the cost was 80% of Laos' annual national budget. "For the Asian Development Bank and many others, the cost is unaffordable for Laos to take on, even at very concessional rates," the international lender's Thailand director Craig Steffensen said Tuesday. Sommath said the precise details relating to funding and a start date for the project are yet to be agreed. Laos is to finance the scheme with a loan from China's EXIM Bank of China. The planned railway would run from Luang Namtha on the Laos-China border to Vientiane, with a standard-gauge track of 1.435 metres, and a maximum speed of 160 kilometres per hour (kph), less than the 200 kph initially planned. The line will require 76 tunnels and 154 bridges, including two across the Mekong River, and 31 stations.